The end of the season always holds mixed emotions for me. When the season is going really good you don’t want the season to end while on the other hand if the season isn’t going the best and you aren’t having fun anymore you just want the season to be over. I’ve experienced both feelings when it comes to the end of the season after a lot of different ways the season has gone. Now that the season has ended I’ve had sometime to think back on the season. The beginning of the season held an amazing start for the team I coached- they won the Lonnie Krahn Classic after a couple of really close games with the BV Blitz. I finally got to go to a tournament that for as long as I can remember I’ve wanted to go to and it was great going to the Ed Horvath Interprovincial tournament because I got to watch some amazing ringette and catch up with people I’ve met since I started with the sport. After Christmas I missed the tournament in Leduc, because of having another commitment the same weekend. Then there was the Esso Golden Ring a tournament I look forward to every season. There is just such amazing ringette to watch in the three days of the tournament with it being the biggest tournament in the world. You get to meet so many amazing people and get to catch up with people when you just spend time at the rinks watching different games. It seems like I was at countless tournaments since the New Year, but there was really only the Esso Golden Ring, Provincial Playdowns, Provincials, the Western Canadian Ringette Championships, and the Ringette Alberta Challenge that I was at. It feels like I was at so many more just with how many times I found myself going to a rink, and now that I’m not going to the rinks it just feels strange. One of my favourite parts of this season was getting the chance to go on the bench with Calgary Rath during one of their games to take photos for a class assignment, and I know that it is something that I’m not going to forget anytime soon. This tops when the team I coached won city finals because I got to be on the bench with a team I have always loved to watch. Winning cities was still an amazing feeling and experience. I never got that experience as a player myself, and the fact the girls I coached made it to the final just showed to me that they really did listen to what I had to tell them throughout the season. Provincials are always something amazing to go to because each year there is something unique about them. And helping with media for the Western Canadian Ringette Championships was a lot of fun because I got to watch some amazing ringette and meet so many new people and catch up with people that I hadn’t seen in a long time. 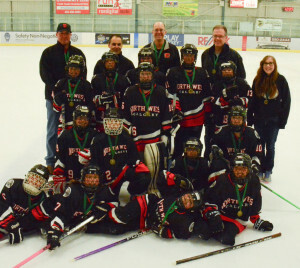 Ringette Alberta Challenge was a really amazing weekend. It’s such a unique event and I had a great time and again I got to catch up with some people I hadn’t seen all season. If it’s in Southern Alberta near Calgary again next year I know that I will for sure be registering to go again. Now that the season is over I’m not too sure what I’m going to be doing until the next season starts. 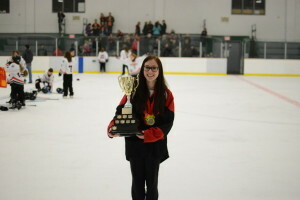 I’ll be working on my ringette magazine and will have an issue of it ready for the beginning of next season. This entry was posted in Blog Posts, Ringette and tagged in another season come and gone, play it love it live it, playing ringette, ringette, ringette season, ringette since 1963, since 1963, team sport, the fastest game on ice.